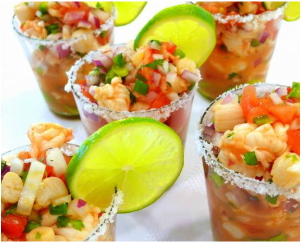 Fresh, crisp shrimp salad goes nicely in martini cups to kick off a BBQ! Toss all ingredients into a large bowl and mix well. Drizzle in a tiny bit of olive oil just enough to cover the ingredients. Finish with FINN ANGLER to taste. I also added spring sprouts!